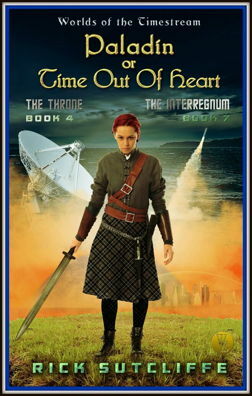 Paladin or Time Out of Heart is alternate-history Irish-flavoured Christian science fiction and the fourth Book in The Throne--a history of Ireland's rulers on alternate Earth Hibernia. It is simultaneously the seventh book in The Interregnum--relating events from 1941 to 2001 when the throne was vacated. To conclude The Throne (Culmanic Parts, Rae's Blood, and Tara's Mother), Paladin resumes the history of Hibernia's monarchs from the late fifteenth century in the perspective of a mysterious woman disgorged from a burned-out bin at the Dublin garbage dump. The Paladin tells her part in the modern lives of long-lived, hard-to-kill, Samadeya-Qayin and Pelik-Qayin, the repentant and unrepentant Cain respectively, always deadly enemies, and in the latest millennium duelling over Ireland's High Kingship. The Paladin's task is to keep Samadeya focused, so she shares the Qayins' long life curse-- when killed with sufficient damage, Heaven reorganizes the remnants as an infant, memories only returning at an apparent mid-twenties age. Was her 1492 self a reset? Why zero prior memories? Paladin also provides Karina Tansey's re-telling of events leading to the First Battle of Glenmorgan. Who was she, and what became of her after Katherina Rourke assumed her identity? Meanwhile, the Paladin's memories surface in several women's shared dreams. Which did she become after her last reset? Who will help prevent previous trauma knowledge resolve a King's mystery? Can Mara discover what surprises Desmond has concocted? Has Eric MacCarthy raised a third army? Will he tip the battle in favour of his uncle Philip? What fate overtakes Tirdian prodigy Lucas Caine, who triggered the recent Nexus, then lost the new Earth? Events of Paladin play out on Hibernia at Tara and Glenmorgan, on Tirdia-0 in the lower mainland of British Columbia, and on four other Earths--Babylon, Desert, Meta, and Tirdia-1.